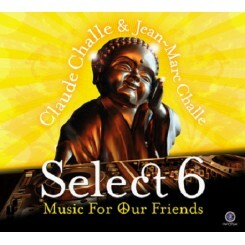 For the 6th time Claude Challe and his brother Jean-Marc bring their annual compilation featuring their music findings this year. 'Select 6: Music For Our Friends' as a 2CD release, presents a chill-out selection and a party selection, following the tradition of the Select's compilations dedicated for a good cocktail followed up by a vibrating dance session. Including new tracks and music from Bliss, Karunesh, Savage Spirits and Parov Stelar feat. Cleo Panther and many, many more. Check out some tracks included in the almost 30 track compilation. Set for release on June 17.